If you like all types of driving, including off-road detours, the Goodyear Wrangler Silent Armor Tire was built with you in mind. Though the tire hides its toughness in an attractive tread design, it delivers solid performance both on and off-road. The Wrangler Silent Armor has an ample amount of visible siping, which gives it the ability to firmly grip the road in wet conditions. It displays exceptional on-road ability with good cornering and improved braking. Goodyear has given it Traction Ridges, which prove useful in mud by pulling in the mud and helping forward motion. These same ridges help propel the vehicle forward in sand as well. The Goodyear Silent Armor is rated for severe snow usage to allow you to use your vehicle for driving through the worst winter conditions, and even in some instances where chains would normally be required. Something we noticed with this model is how quiet the tire is. We were expecting a lot of road noise, but just the opposite was true. It is among the most quiet tires in its class. Inside the tire you’ll find an Armor Zone to provide extra toughness to the tire. Goodyear has used DuPont Kevlar which is said to be five times stronger than steel to cover two steel belts in the tire. Kevlar also has the ability to absorb road noise resulting in a quiet ride for passengers. The sidewall has special compounds which provide strength to the tire and reduces the risk of punctures when you are driving. While parking against the curb you need not worry about your alloys since the tire comes with a Rim Protector. This Wrangler also facilitates better fuel economy than other tires in its segment, which saves you money in the long run. Overall, the Goodyear Wrangler Silent Armor is built for toughness and can be used in a variety of on and off-road driving. It tackles any type of road and weather conditions for true all-season use. 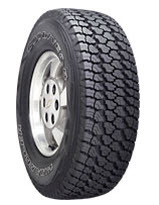 Prices range from about $140 for the 15 inch series to approximately $240 for the 20 inch series tires. Who Are Goodyear Wrangler Silent Armor Tires Designed For? The Goodyear Wrangler Silent Armor Tires are designed for on-road or off-road driving enthusiasts who are seeking a great looking, high performance tire with excellent traction and handling characteristics all year round regardless of weather conditions. Some may find it a bit more expensive than other tires in the same segment, but it provides great value. Goodyear Tires backs up the Wrangler Silent Armor with a 6 years or 50,000 miles tread life guarantee. A tire uniformity warranty of 6 months or the first 2/32 inches of wear is also included. Materials and workmanship are guaranteed for 6 years and call for a free tire replacement the first year or the first 2/32 inch of wear. The amount is then prorated until the final 2/2 inch of useable tread life. You’ll also find Goodyear’s 30-day test drive guarantee and a 2-year roadside warranty program as well.